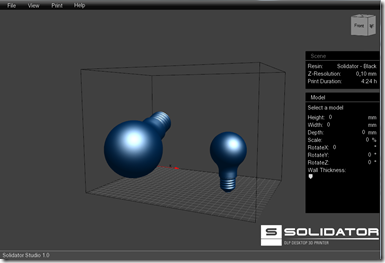 Now that you have either downloaded some existing 3D model or created your own, it's time to prepare that model for printing with the Solidator 3D Printer. 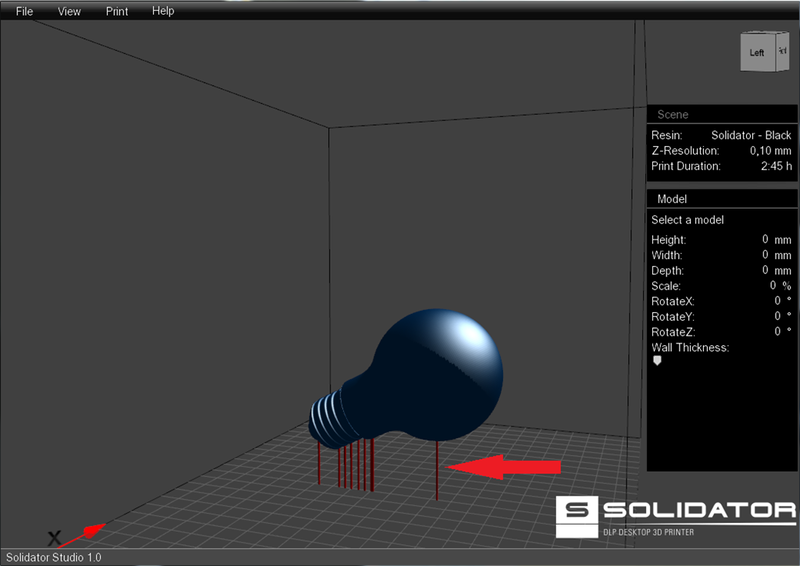 This page demonstrates all necessary steps in order to print a 3D object with the Solidator 3D Printer. 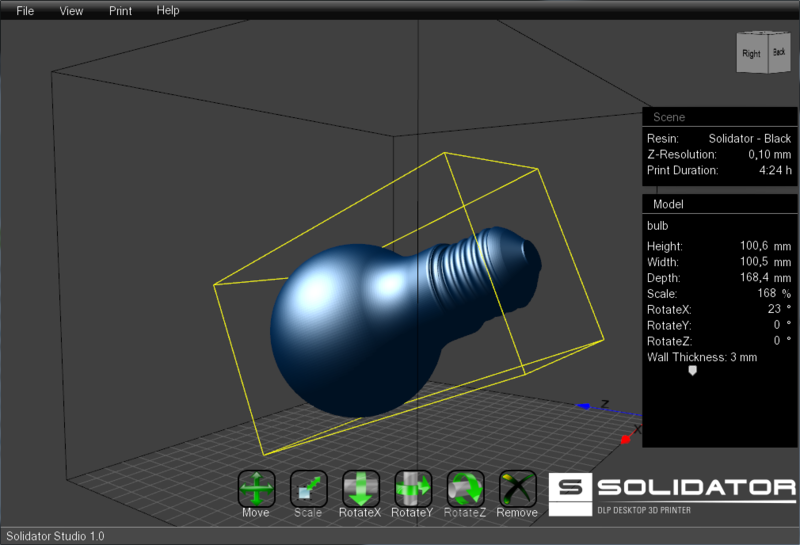 STL Files (.stl), 3D Scene Files (.3ds), Autodesk ASCII Export (.ase) and 3D Object Files (.obj). 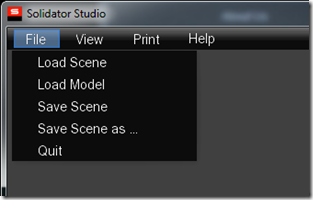 Open the Solidator Studio software and chose "Import" from the "File" menu. 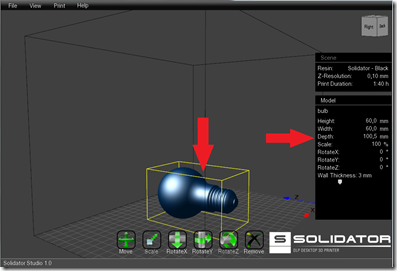 Select the file you want to print and hit "OK."
The model will be loaded and the Solidator Studio places the object at the bottom center of the building area. Repeat this step for each object you want to be printed in a single print job. You can move your view camera around the printing scene by holding down the left mouse button and moving the mouse. Zoom in and out the scene using the mouse wheel. In order to create an optimal print experience, it is necessary to arrange the objects to be printed regarding a few key points: size, orientation, position and solidity. Select an object by clicking it with the left mouse button. 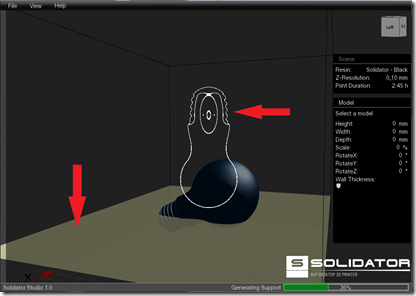 A yellow wireframe will be drawn around the selected object, and the property panes will display all information available to that selected object. First, determine how large your printed object should be. If you know the exact dimensions, enter them into the “Model” property pane, and your object will change its size accordingly. Otherwise, you can use the mouse to scale the object. 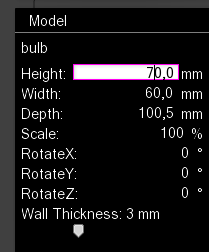 Click the “Scale” button from the tools pane at the bottom of the screen. Then click and hold the left mouse button in the scene and move the mouse. Your object will change its size matching your mouse movements. In the next step you need to deal with the orientation of the object you want to print. Since you are going to print a real object, physical rules apply while printing the object. Rotate your object around the X-, Y- and Z-axes so that it makes as much contact as possible to the floor of the printing scene. For example, if you are printing a bust, you would like its pedestal stand on the floor of the scene rather than the top of its head. 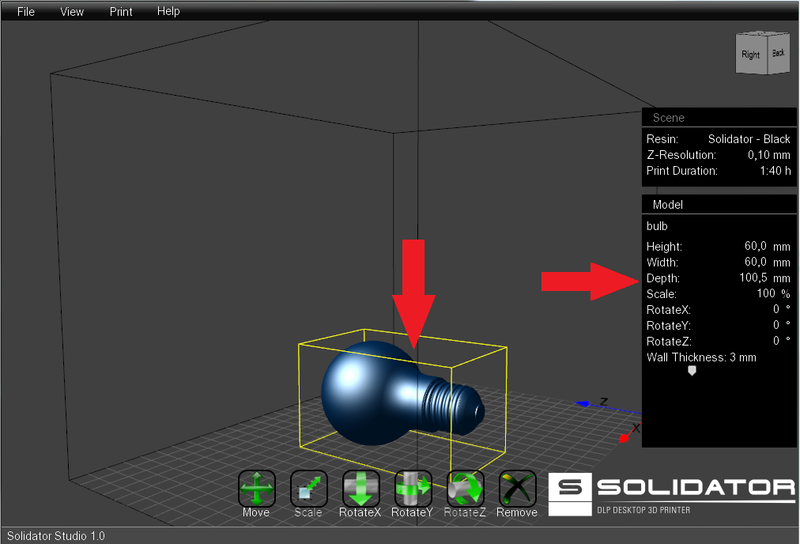 For rotating an object, select it and click on one of the “Rotate” buttons from the tools pane. 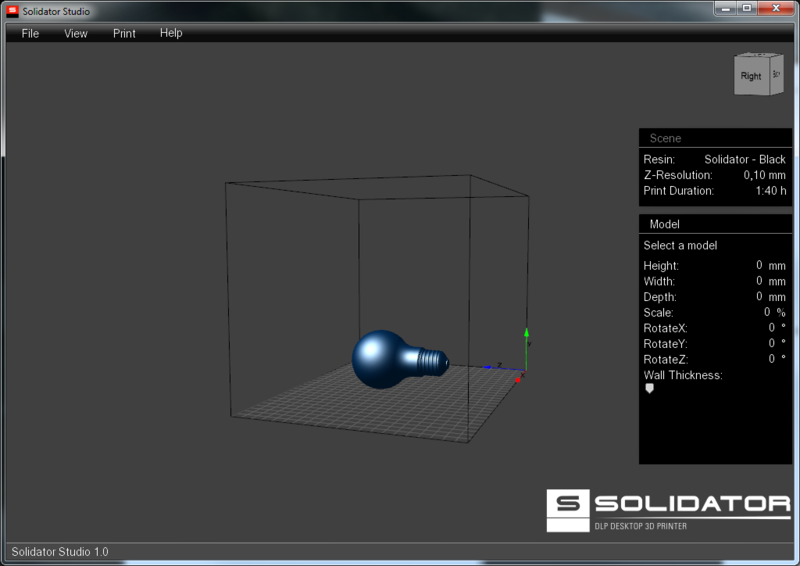 Click and drag the object to rotate it around the selected axis. 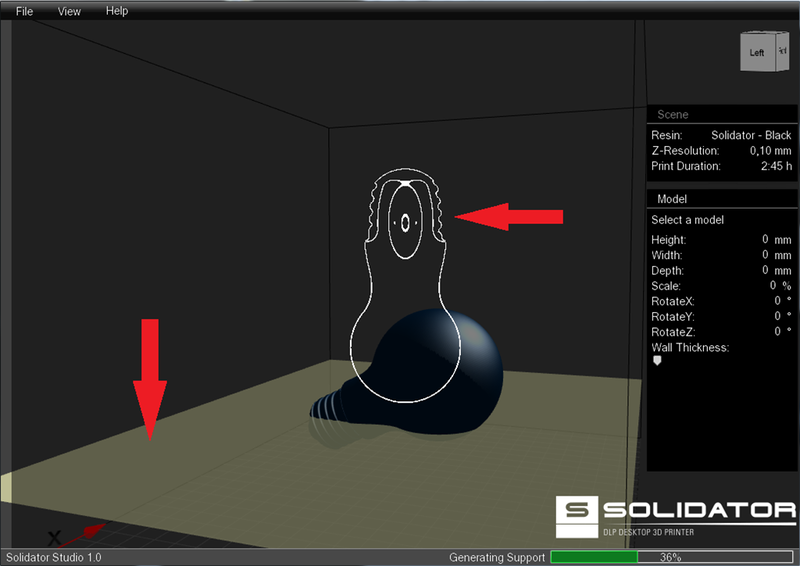 Using the “Move” tool from the tool pane allows you to position a selected object anywhere on the scene floor. This comes in handy when printing multiple objects in one single print job. Since printing multiple objects simultaneously does not increase print duration, this is a big deal! The tallest object determines the total print time. Save print resin and money! Rock-solid objects use a lot of resin for the inside, which is not really necessary. A hollow object with an adequate wall thickness is usually sufficient. Use the slider in the “Model” pane and adjust the wall thickness. 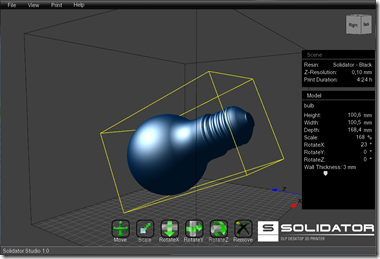 A thickness of “zero” makes the selected object solid. Objects that do not touch the ground or have “hanging” parts that are not directly connected to the ground would be printed “in the air.” This is physically impossible. So they need to be supported by structures that connected those parts to the ground or grounded structures below them. 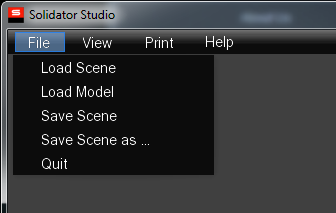 In order to see where your model needs to be supported, select “Preview Support” from the “View” menu. A plane will start moving upward through your object, cutting it into virtual “slices.” You can watch the slicing process in a preview overlay. Based on these slices the support structures are calculated and displayed after a complete swipe. It is advisable to have the least support structures possible. When you have finished the preparation of your object(s) to be printed, you can export the print data to a T3D file that contains all information necessary for the Solidator Printer to process the job. But you cannot import that format into Solidator Studio again! 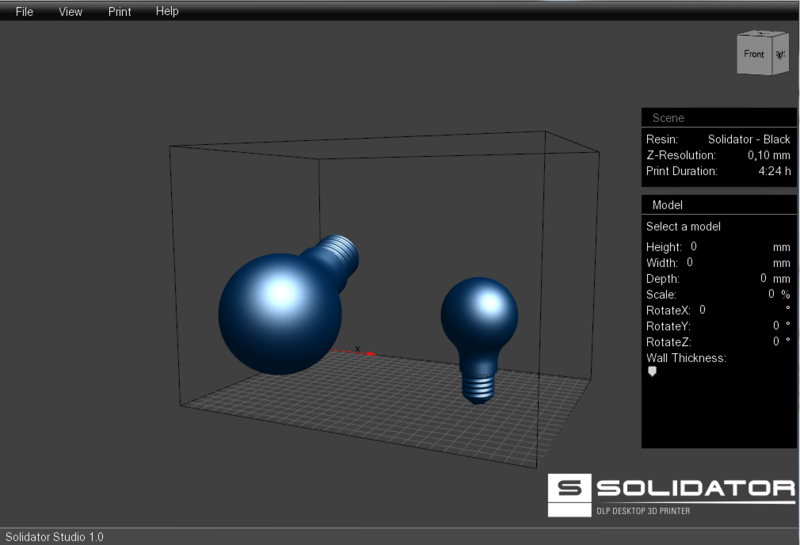 Use the T3D format to publish your creation to the Solidator Gallery or share it with others. Store the T3D file on a USB stick and plug it into the Solidator 3D Printer to print the scene. Continue reading about the printing process. 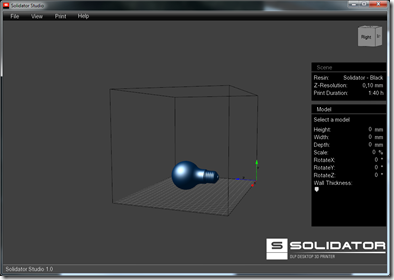 If you are using the LAN or WiFi feature of the Solidator 3D printer, you can skip the manual data transfer via USB. 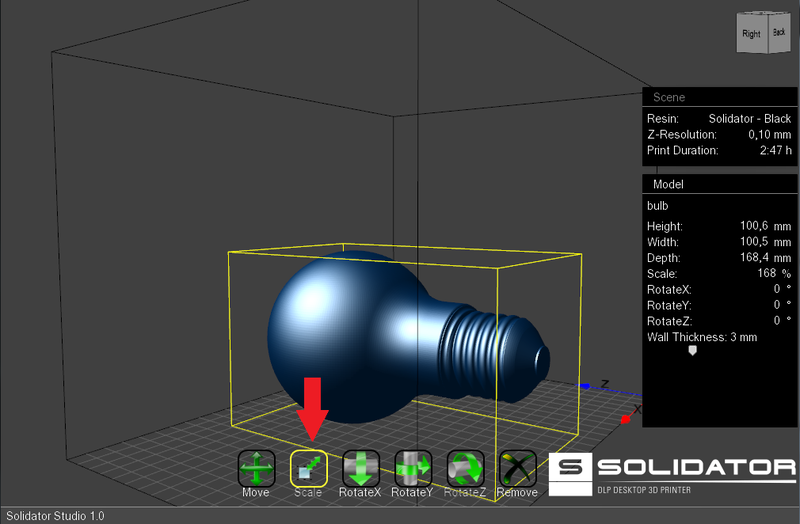 Select “Send to Printer” from the “Print” menu and after the export process the scene and related job will be instantly transferred to the Solidator 3D printer. Continue reading about the printing process.